scans_daily | The Shadow/Batman's a battle between histories. The Shadow/Batman's a battle between histories. 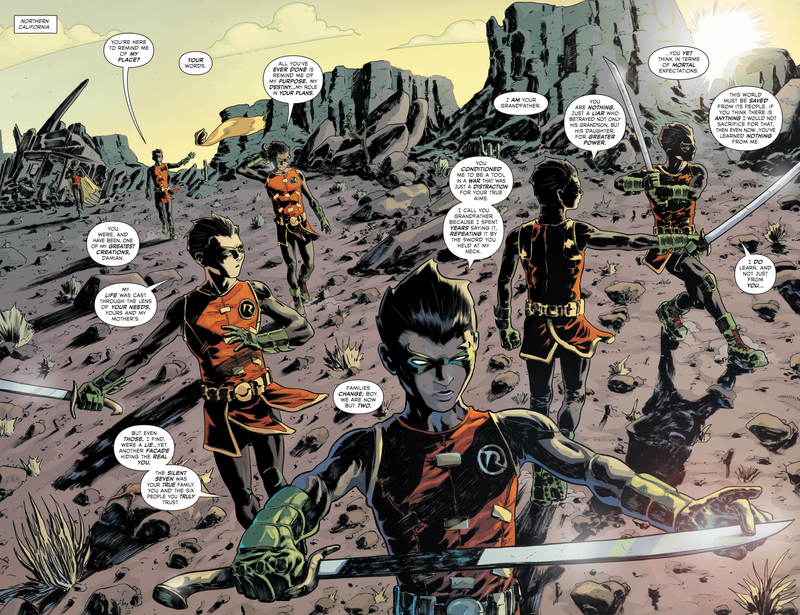 On one side, there's three generations of heroes- the Shadow, Batman, and Damian Wayne as Robin. On the other, there's the Silent Seven, the secret masters of the world. 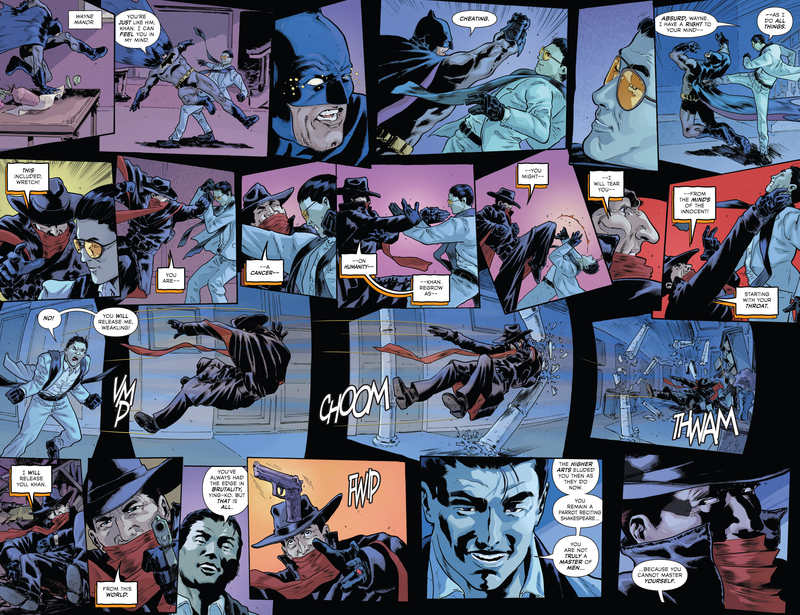 The Shadow and Batman mounted a financial attack on the Seven. 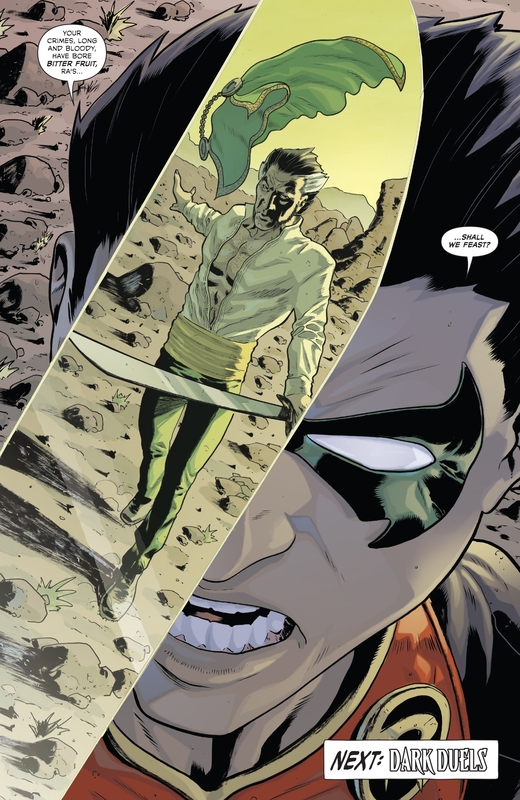 The Seven's two masters, Ra's al Ghul and Shiwan Khan, noticed. Khan ignored Ra's counsel that they not rise to the bait.
" 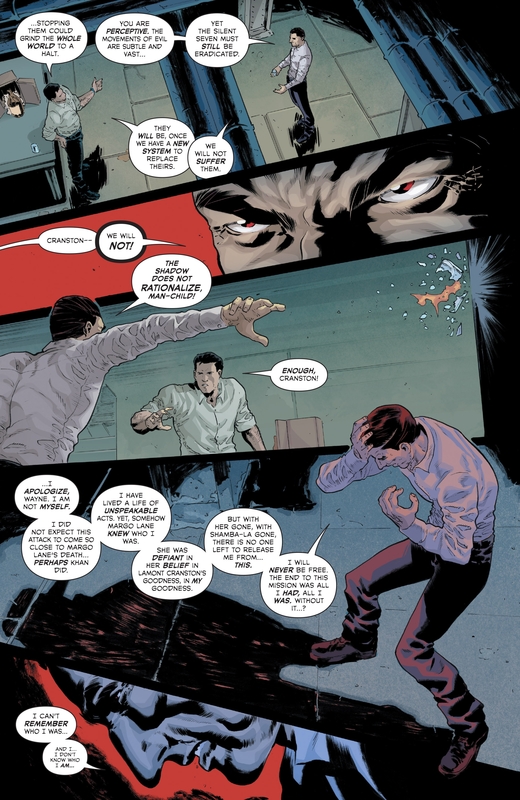 To allow the Shadow to believe that he's defeated the Silent Seven, even falsely.. "
(The Shadow and Batman's relationship in this follows from the previous Batman/the Shadow, in which at least Henri Ducard had turned out to be the Shadow in a guise, training Bruce Wayne to be his successor. 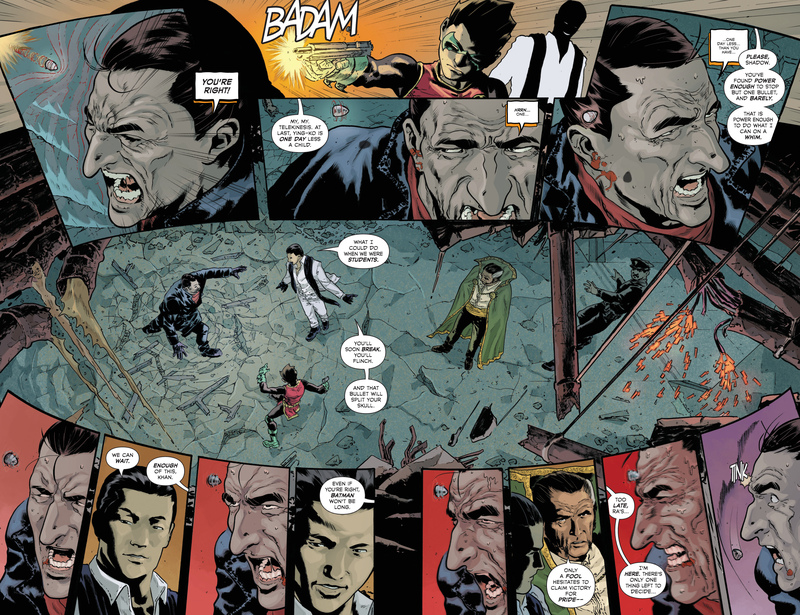 In New Jersey, Damian, seeking to prove himself, confronted one of the Seven's operatives on his own. The man responded in a voice not his own.
" 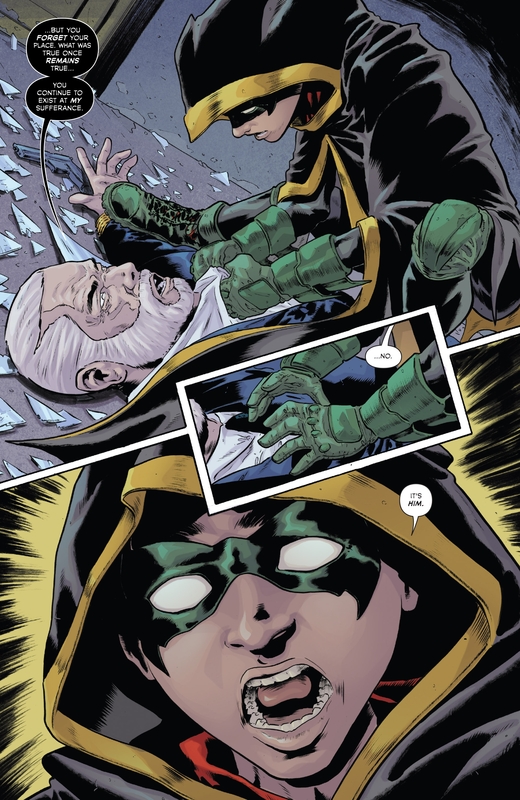 .. so, Damian. You found us. You remain impressive as ever..
Back at Wayne Manor, Bruce learned that their attack'd been countered in an instant.
" .. we're still not looking at this right. If we're going to draw out the Silent Seven, we need to be bigger. More provocative.
" We need to get a reaction. " " Do not worry, Bruce Wayne. Shiwan Khan sauntered down the stairs, nonchalantly greeting the Shadow. He laughed off Bruce's threats against him and his partner in the Seven.
" Please.. you schedule plans in days and weeks instead of generations. You called down the invisible hand, yes..
" But after all these years of perfect, hidden control, did you truly think I'd reveal myself publicly? " In New York, Damian prepared himself to confront Ra's. Back at Wayne Manor, Bruce stripped down to his costume and donned his cowl. 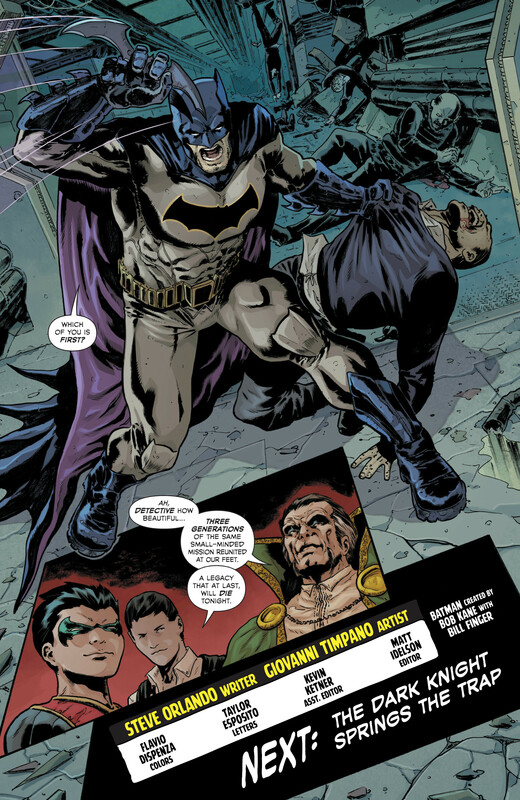 The Shadow regarded Batman, in whom Khan'd put himself and given the gun. Khan handled them with little difficulty from there, taking the Shadow and triggering the collapse of Wayne Manor with a mechanism the Seven'd had in place for some time. Damian, meanwhile, struck at the Silent Seven, gathering what they'd kept for themselves. 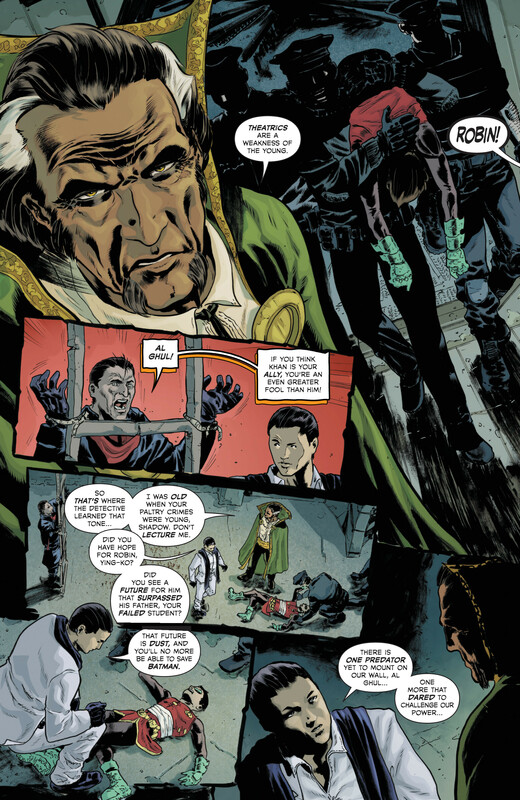 While Batman considered what'd happened and the Shadow listened to Khan describe him, Damian walked. 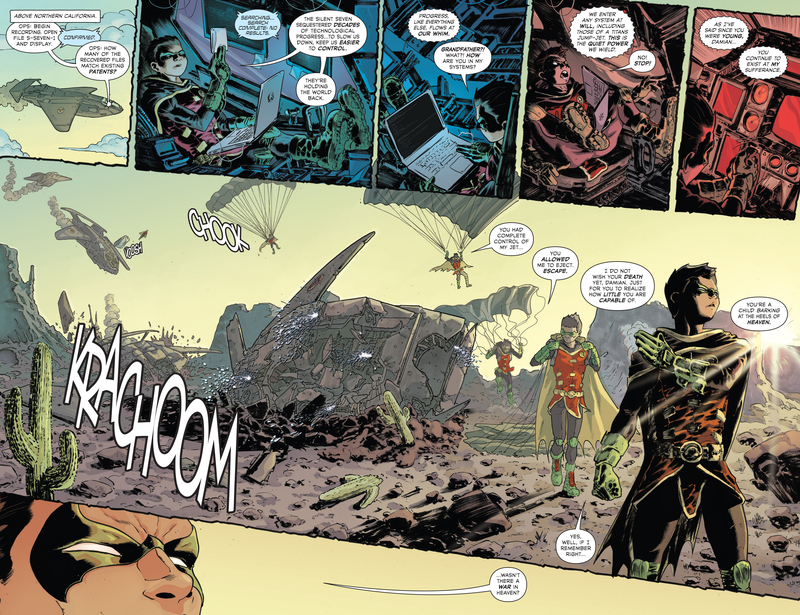 Ra's defeated Damian and returned to Khan gloating over the Shadow.
" .. shall we let him see us? " He found them on his own, by looking at how they'd countered his last move. He noticed that all their financial moves to that end could be traced until they vanished. He noticed that all of those points of vanishing formed a region. Off he went towards it. There, under him, Khan played puppetmaster again. 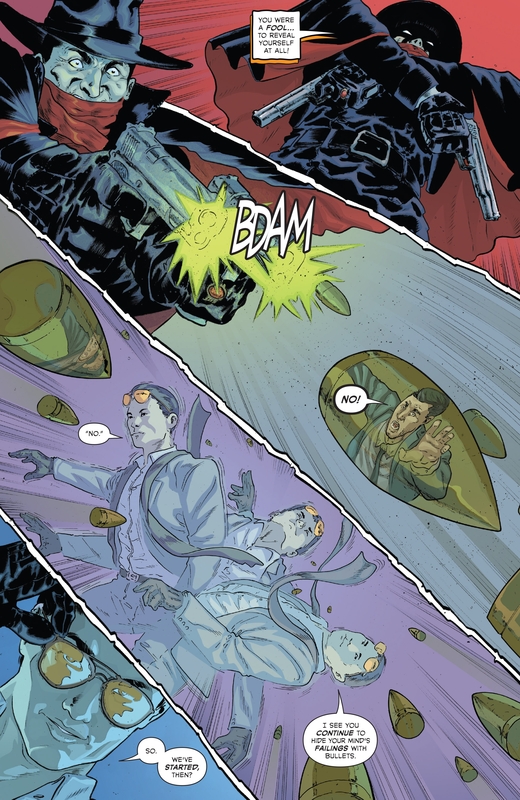 This time, the puppet was Damian, a gun in his hand and Khan's opinion of the Shadow out of his mouth.
" You're right, damn you! " 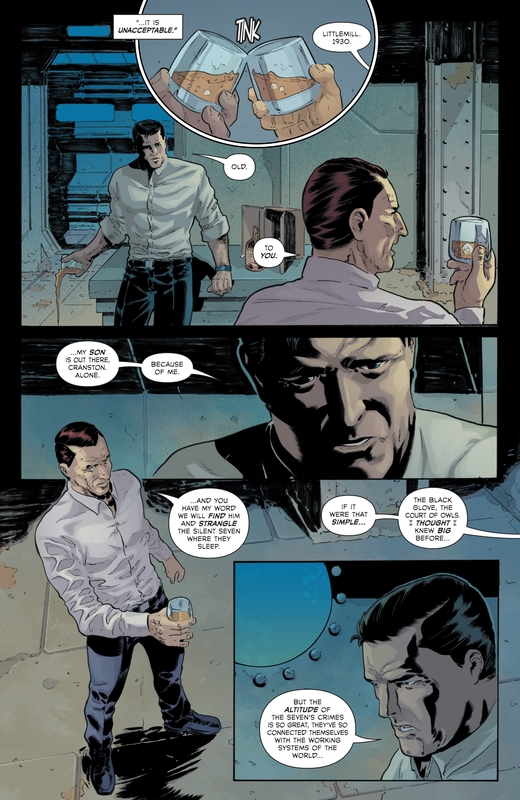 It's so weird seeing Batman on such good terms with The Shadow, considering Cranston is on Punisher levels of depravity. I get Bruce might respect him as a detective, but The Shadow is a mass murderer, and a very cruel one at that. So it's bizarre he'd give him the time of day.